Double sided flex PCBs? Drill does that! Ever thought about making a double-sided flex board? Well, do I have the post for you! 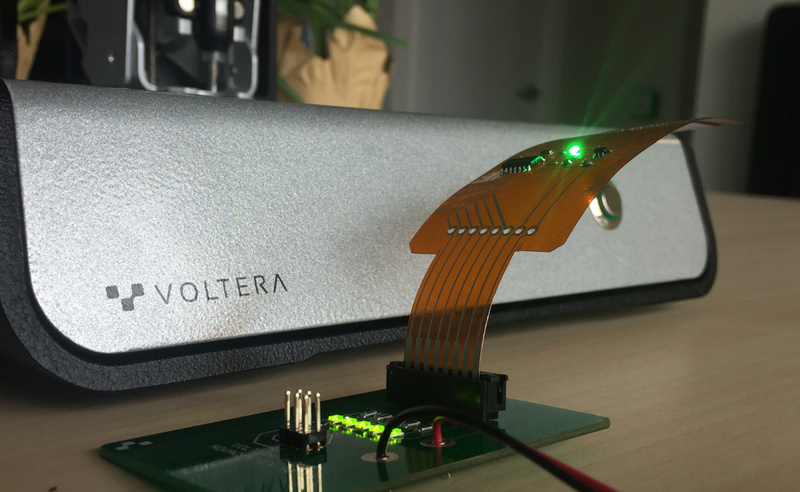 With the Voltera Drill launch, we’ve heard lots of great feedback from our users about how much easier it’s making their PCB prototyping process. While access to vias and robust through-hole connections is pretty great for double-sided rigid boards, it got me thinking… could this be expanded to flex boards? Earlier this week, I took a detour from my other projects to prepare some V-One demo boards. I like to use these demo builds to try out some experimental approaches - turns out this was the perfect opportunity to try out the Drill on flex! I should say, this is definitely not the first time I’ve tackled double-sided flex. However, thanks to the Drill, this is the first time I’ve nailed down a process which I think is worth sharing (i.e., didn’t have me holding my breath the whole time). In fact, the Drill add-on drastically improved the entire experience, in more ways than one! If you’ve never worked with flexible electronics, hopefully this demo build will give you some inspiration to try it out. Onward! Sidebar - What are flexible electronics? Flex boards allow you to fit and connect electronics in places where a rigid pcb just wouldn’t do the job - for example, if your electronics need to conform to some 3D shape, or need to be allowed to move dynamically. 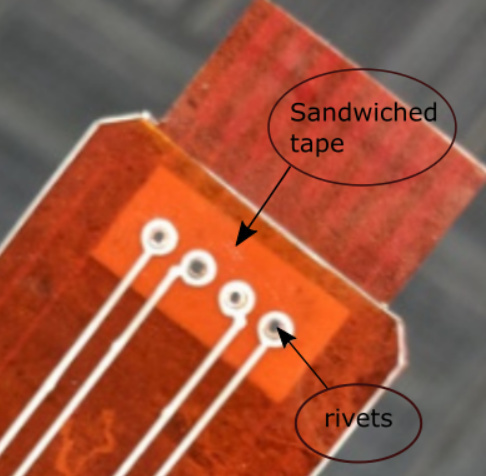 The simplest and most ubiquitous example is the Flexible Flat Cable (FFC), which simply connects two rigid boards through a ZIF connector. 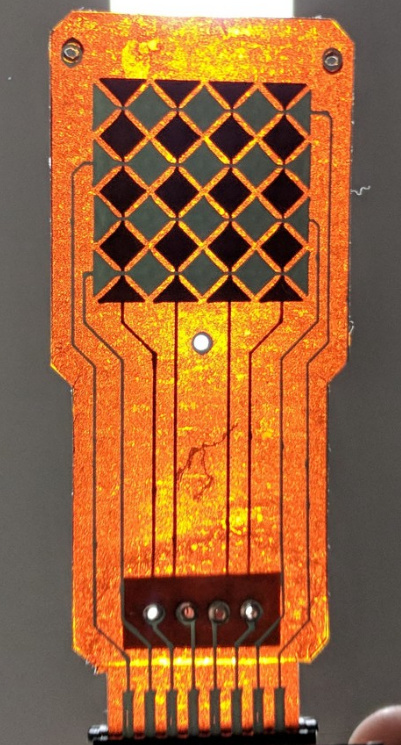 When you need something a little bit more complicated, where the flexible electronics have some functional components or structures, that’s when you get into the realm of Flexible Electronics and Printed Electronics. 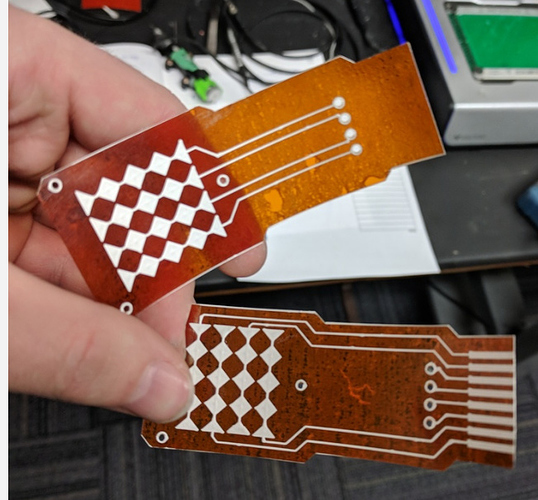 These are like your standard rigid PCBs, but built on a flexible substrate (most commonly, Kapton (polyimide) or PET), and often times built with conductive inks instead of copper. When it comes to these technologies, there is more than enough information to fill an entire blog post - so for now, let’s jump in to the build! 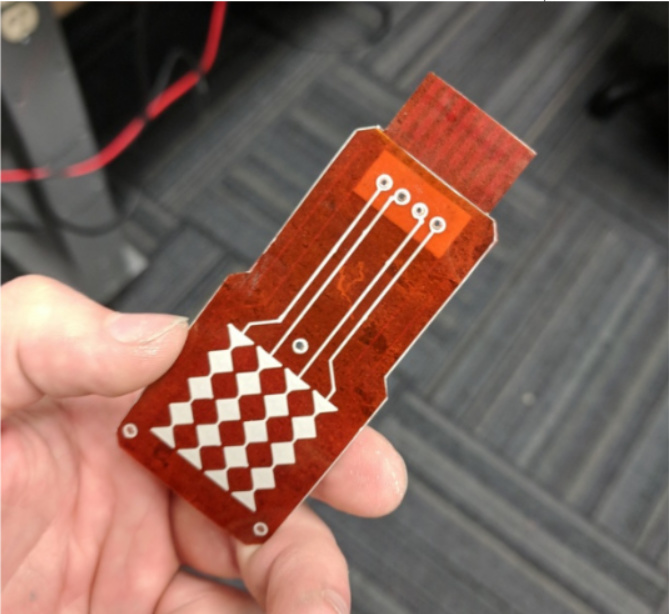 Full disclosure: This design is intended to show off the double-sided flex process, not to be the world’s best touch sensor. 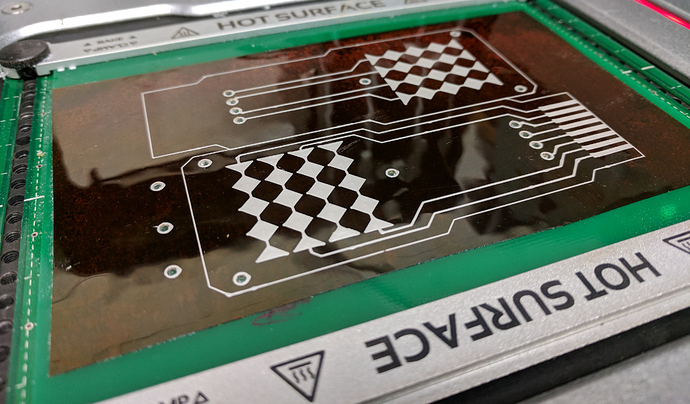 If you’re looking for a fully-functional flex pcb project, skip to the bottom for a teaser of an upcoming post - I’m sure that’s more up your alley. Plain double-sided foam tape (example) - 1/16" thick. A 2.54mm, 8-pin ZIF connector (to connect to a rigid board). Rather than ITO on glass, this build was done with our Flexible Conductive Ink on 5-mil Adhesive-backed Kapton. 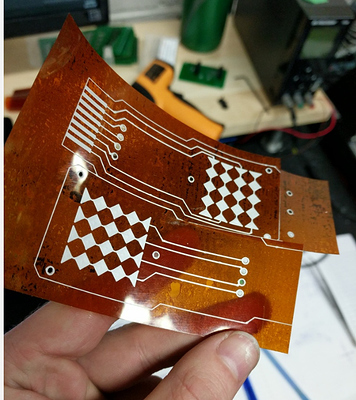 Since you can just cut your kapton to shape, you can do both layers in one print step! This takes a bit of finagling in your CAD tool, but if you don’t mind that, you can skip a whole extra drill / print / bake step - I opted for this approach. After designing the board in EAGLE (left), a few copy-paste-deletes later and had both sides in one layer, ready for printing (right). To connect the layers, we’ll be using 1.0mm rivets and a small strip of double-sided tape (see further down for the process). I put in an outline trace, to help with cutting out the kapton later. Step 2: Prep your substrate! For this step, you’ll need your sacrificial layer, the kapton, the 3x4" FR1 panel, and a credit card or other tool for flattening the kapton and removing any bubbles. When prepping your kapton, the most important thing is to make sure the entire layer is flat! Since the kapton is flexible, any air pockets or debris underneath the substrate will cause the kapton to deflect during the probing stage, which will give you an incorrect height. Wipe down the 3x4" FR1 with a clean cloth / wipe and some isopropyl alcohol, then let it dry (should take a few seconds. Clamp down your FR1 on top of the sacrificial layer. Cut your kapton to about 3x4", to fit on the FR1 panel. Peel back the adhesive backing, and carefully apply the adhesive-backed kapton to the FR1 panel. Use the card to smoothly apply the kapton a bit at a time, carefully peeling back the adhesive backing as you go. Inspect the kapton for any bubbles - if it’s flat to the FR1, you’re good to go! A rippled look is ok, the main thing you’re looking for is obvious bubbles or debris. If you’ve done the Voltera Punk Console tutorial, this step is a breeze - simply drill your kapton. NOTE: Make sure you mounted your FR1 underneath the kapton, and you’re not drilling straight through the sacrificial layer! If you only realized this now, no worries - just change the ‘Drill Depth’ parameter in advanced settings to 0.75mm. This is just a regular old aligned print, but with a manual heating profile. Since we’re curing the ink right-side up, we need to up the curing temperature a bit to make sure the kapton reaches the required 140-160C. I used a curing profile of 200C for 20minutes, which gave me a peak temp of 150C at the kapton surface. Heads up: A good adhesive will keep flat during the whole bake, but some adhesive-backed kapton substrates can lift off during the bake. If it starts to raise up during the baking process, use the thumbscrews or the clamps to push it down. It’s easiest to peel off the kapton when the adhesive is still a bit warm. 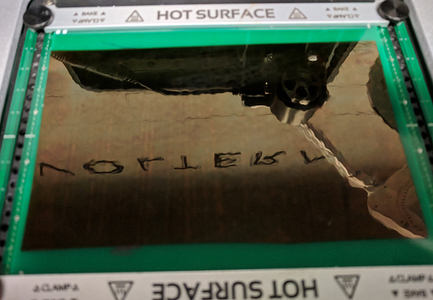 Once the heater cools down to 50C, grab the edge with some tweezers and it should come right off the FR1 without any trouble. Once that’s done, go ahead and cut out your two layers with scissors. Peeled, and started to cut! For this step, you’ll need a small strip of double-sided tape, the 1.0mm rivets for your vias, and the riveting tool. First, start by cutting off a small piece of double sided tape (just enough to cover the vias), and stick it to the underside of one of your layers, underneath the via holes. Unlike rigid boards, kapton is so thin that the rivets need some added support on the walls to prevent them from crumpling - hence the tape, which is sandwiched between your two layers. When the tape is in place, insert your rivets through the ink-side of the kapton, so that they stick into the foam tape, then push them so the copper goes all the way through the foam tape. At this point, all you need to do is place the second kapton layer (ink side facing out) so that the rivets go through the drilled holes. The adhesive backing on the kapton will join the layers everywhere else with just a bit of pressure, making sure there’s no air gap between your two kapton layers. All that’s left to do is secure the rivets like normal, and check continuity. Since we’re using flex ink, it can conform to the shape of the rivets, so it’s very forgiving. With the rivets secured, your double-sided print is ready for action. Thanks for reading, and good luck with your prints! I’m thinking of getting voltera for printing on flex andI’m looking forward to the next demo!